It was exclusive, exquisite and by invitation only. In high gala spirits, 1,100 special guests jet-set onto the exotic setting of the Paris Resort in Las Vegas. They were there for one purpose and one purpose only, to celebrate in grand style, the 70th Anniversary birthday bash of Steve Forbes, Editor-in-chief of Forbes media. Among the prestigious “A” list guests was Jefford Curre’. The Bahamas leading man of action was given a much welcome seat at table one. 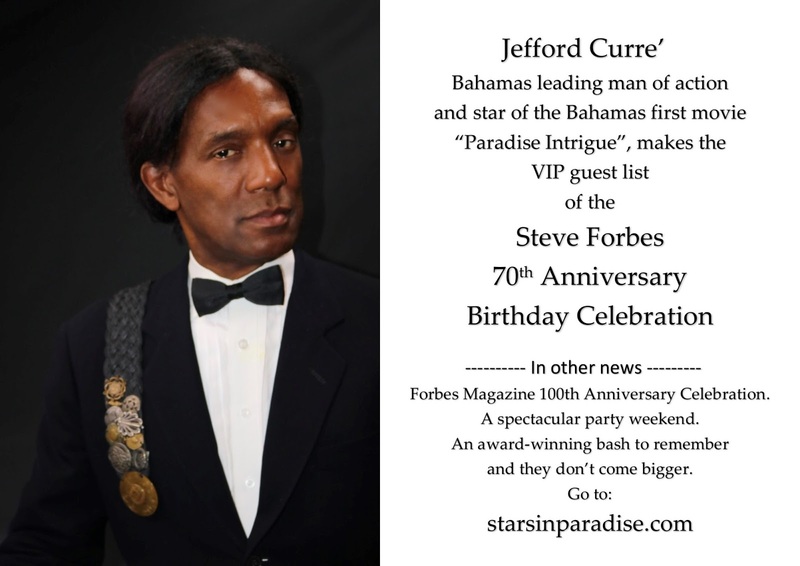 The star of the Bahamas first movie, “Paradise Intrigue’’ was among only thirty guests that was invited on a full complimentary VIP invitation to this award-winning evening. As always, he passed on the wine in exchange for a glass of virgin cranberry juice with no ice. He was then officially welcomed with a handshake from Mr. Forbes. After a few press snapshots, the evening got going with a blazing start. The event was spectacular and they don’t come bigger. Take a deep breath, there’s more, the party doesn’t stop there. The Forbes brothers moved the party invasion to New York City, with a guest audience of 1,000. Kicking off another round of outrageous fun and frolic as they celebrated the 100 anniversary of Forbes magazine. The Forbes are no stranger to lavish events. In 1989 Malcolm Forbes, Steve Forbes father, set the bench mark high, sparing no expenses for a memorable time. For his 70th birthday celebration, he flew 800 plus invitees in three Morocco-bound jets, charted by Forbes at a reported cost of $1 million. It was an all-expense paid scrumptious happening. Names like Elizabeth Taylor, Oscar de la Renta, Barbara Walters and Walter Cronkite were just a few among the Who’s Who celebrity guest list. Well that was then. Today a new generation of Forbes, continue to raise the bar, with an even bigger focus on people and encouraging wealth, to create a better world. The Forbes line up of celebrations brought together the best of the best and some of the most brilliant minds on the planet. Previous PostNominee Finalist Countdown – Who Will Win The Jefford Curre’ Distinguished Medal of Honor?Next PostBAHAMAS FILM INDUSTRY NEWS report. WHO WILL WIN the most sought after accolade in the new world of Box-office excitement?